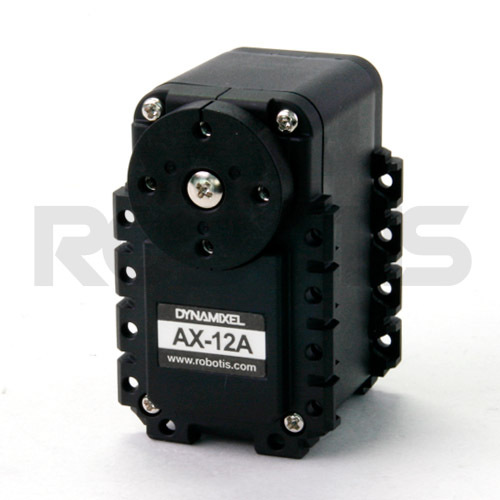 I bought two servos Dynamixel, the AX-12A, which are the basic servos version of the Korean company Robotis inc.
Dynamixel servomotors are like Ferrari in the world of the cars : the best servomotors on the market. They are not particularly expensive: about $ 45 U.S., in Europe about 45-50 euros. These servomotors have difficulty connecting to the Arduino. In fact, the half-duplex communication to 1Mbps requires additional circuitry to make connections to Arduino if there are several servos to be connected. 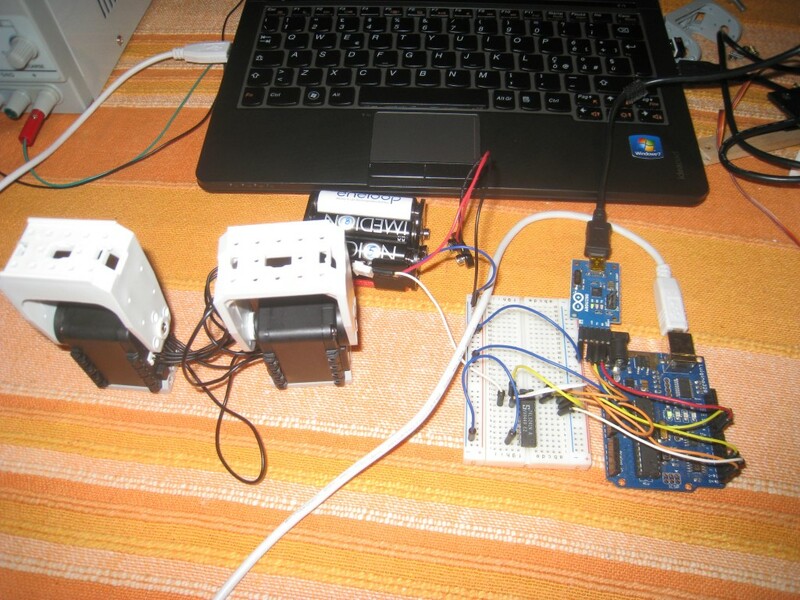 A single servo can be connected directly to the Arduino, in the case of several actuators it is necessary to use a tri-state buffer, which is placed between the Arduino and AX-12A. A simple tri-state buffer is the 74LS241N. 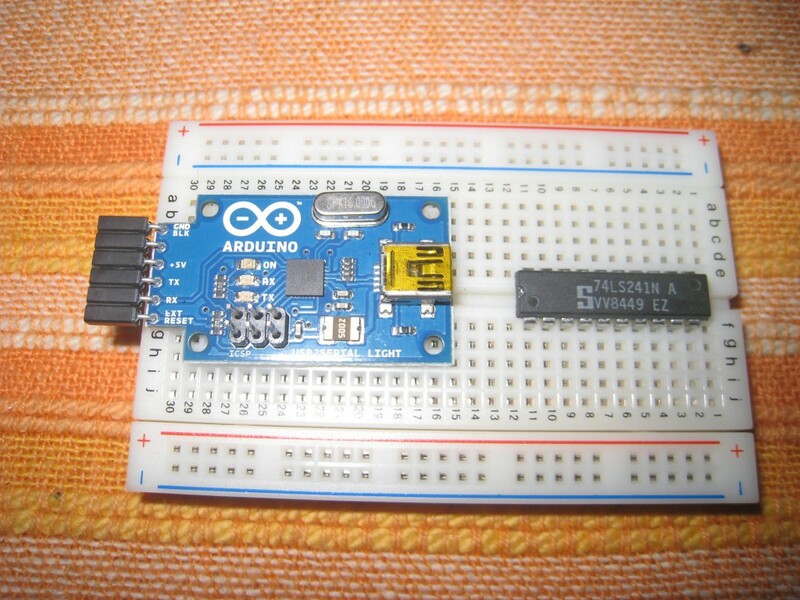 The Dynamixel protocol is a serial protocol, so, Arduino side, the buffer 74LS241 must be connected to the serial port and then on pins 0 and 1. This is a problem: if the serial port is used byDynamixel, how to display information through the Arduino IDE Serial monitor? We need another serial port. 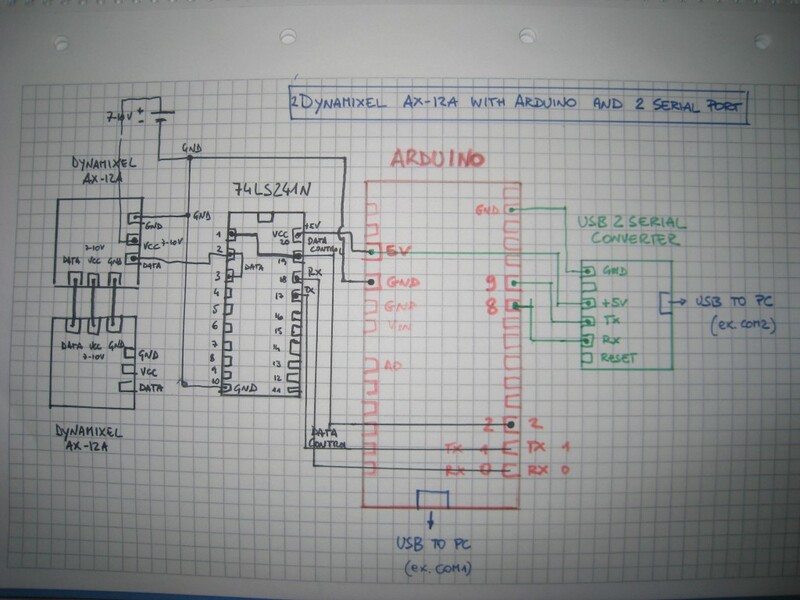 The Arduino library NewSoftSerial can help us, but we also need a USB-serial converter. I chose the converter USB2Serial built from Arduino team. This is a picture of all the components needed to use the Dynamixel Servos. 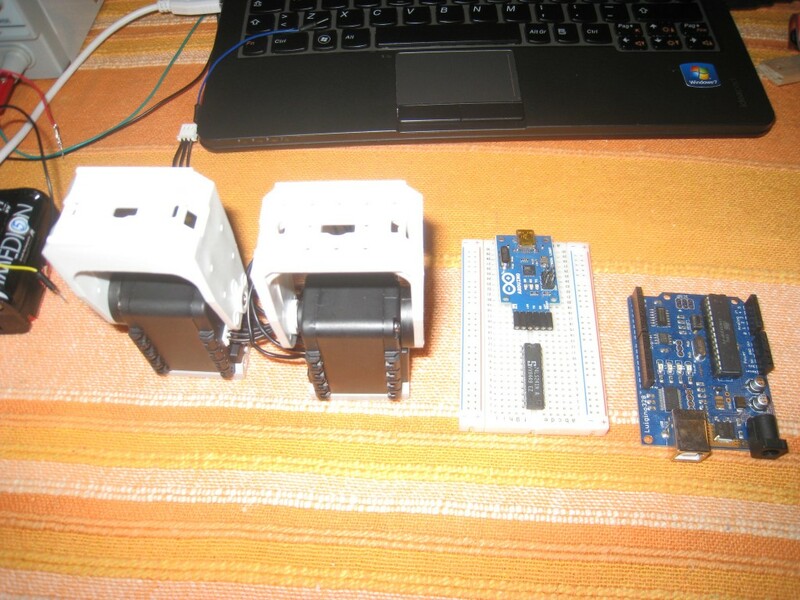 Dynamixel servos require a software library to work with Arduino. An awesome library, realized by Savage Electronics, can be found here. Instructions can be found here. This is a short video showing the Dynamixel servos in action. It is possible also to see the values printed in the Serial monitor with the NewSoftSerial throw the Serial port between the pins 8 and 9. This entry was posted on 24 December 2011, 20:47 and is filed under Auduino, Dynamixel. You can follow any responses to this entry through RSS 2.0. You can skip to the end and leave a response. Pinging is currently not allowed. have solution for this problem ? please email me back if u know!